FIME, an external and independent third party laboratory, has certified that Atmel’s AT90SC12872RCFT secure microcontroller (mCu) is compliant with ICAO (International Civil Aviation Organization) and ISO 14443 specifications (contactless interface for smart card). 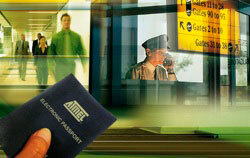 This means that Atmel’s IC fulfills all technical requirements for ePassport and contactless ID applications. ROUSSET, France, June 20–Atmel® Corporation (Nasdaq: ATML), announced today that FIME, an external and independent third party laboratory, has certified that Atmel’s AT90SC12872RCFT secure microcontroller is compliant with ICAO (International Civil Aviation Organization) and ISO 14443 specifications (contactless interface for smart card). The FIME report is available from Atmel upon request. FIME offers a complete range of test services for ePassport applications including Layers A and 1 to 7 under the current ICAO specifications, distributes qualified ePassport test benches and supports its worldwide customers from the initial product specification to the commercial launch. Atmel is a worldwide leader in the design and manufacture of microcontrollers, advanced logic, mixed-signal, non-volatile memory and radio frequency (RF) components. Leveraging one of the industry’s broadest intellectual property (IP) technology portfolios, Atmel is able to provide the electronics industry with complete system solutions focused on consumer, industrial, security, communications, computing and automotive markets. Atmel®, logo and combinations thereof, and others, are registered trademarks or trademarks of Atmel Corporation or its subsidiaries. Other terms and product names may be trademarks of others. Through a complete and integrated test offer, test tools distribution, consulting and outsourced R&D for successful “IC-projects,” FIME is a genuine business catalyst. Pioneer of contact smart card testing in the 90’s, FIME is affirming its leadership in the contactless smart card market today. With 100 employees on three continents, FIME provides a solution adapted to the local needs of its customers. FIME, an affiliate of France Telecom, offers the flexibility and reactivity of an SME as well as the financial stability of a large group. FIME is a brand of Groupe Silicomp. In January 2007, France Telecom acquired more than 90% of Groupe Silicomp, which is part of the Orange Business Services offering. For more information, visit http://www.fime.com.